With the U.S. on the brink of ditching them, Canada should strengthen equal access rules, OpenMedia says. Prime Minister Justin Trudeau greets students from Girls Who Code, a national non-profit organization which teaches computer skills to girls, in Providence, R.I., July 14, 2017. 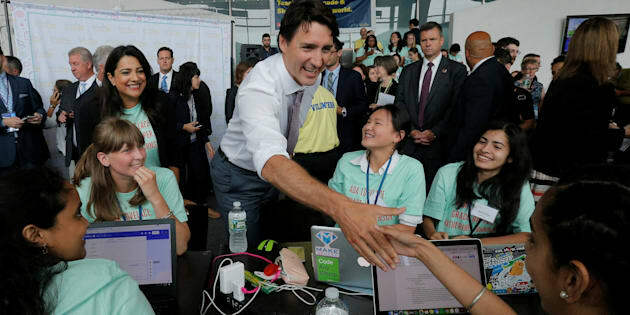 Trudeau's support of "net neutrality" is encouraging but the concept should be enshrined in federal law to protect it from being dismantled, an open-internet activist said Thursday. TORONTO — Prime Minister Justin Trudeau's support of "net neutrality" is encouraging but the concept should be enshrined in federal law to protect it from being dismantled, an open-internet activist said Thursday. The comments came as it appears likely that the U.S. Federal Communications Commission will overturn an Obama-era policy that prevents internet service providers from using pricing or other barriers to block or favour content. "I think one of the good things right now is that we do have net neutrality in Canada," said OpenMedia executive director Laura Tribe in an interview from Ottawa. But, she added, Canadian net neutrality is protected in multiple decisions by a federal regulator rather than in specific sections of either the Broadcast or Telecommunications acts, which govern the internet and communications services. "What OpenMedia is asking for is: for net neutrality to be enshrined in principle in the Telecommunications Act itself, to make sure this is no longer interpreted in multiple (CRTC) decisions ... and really clearly spelled out," Tribe said. Tribe acknowledged that the Trudeau government's previously announced review of the two acts may pose a risk as well as an opportunity but added that said she's encouraged by the prime minister's remarks this week. The prime minister told reporters at a housing announcement in Toronto late Wednesday, that "we need to continue to defend net neutrality. And I will." Trudeau didn't specify what his government would do if, as expected, the FCC votes in December to remove restrictions to how U.S. internet service providers manage their networks. The deciding vote will likely be cast by FCC chair Ajit Pai, an appointee of U.S. President Donald Trump. Both have been critics of restrictions on internet service providers. Alyssa Moore, a policy and strategy analyst for Calgary-based Cybera.ca, said that a change in U.S. regulatory policy wouldn't have direct impact to Canadian internet users but could affect Canadian competitiveness in the United States. "This could take the form of American ISPs (internet service providers) prioritizing their own content traffic in the form of zero-rating it, or delivering it at better speeds," Moore said in an email. Moore also said that submissions to a 2016 consultation by the Canadian Radio-television and Telecommunications Commission showed that several Canadian ISPs support the ability to zero-rate content. Ajit Pai, Chairman of the Federal Communications Commission (FCC), testifies before a Senate Appropriations Financial Services and General Government Subcommittee on Capitol Hill in Washington, D.C., June 20, 2017. University of Ottawa law professor Michael Geist agreed that some of the major Canadian telecom providers have opposed net neutrality in the past and probably still do. "That said, it is now viewed by the government as an integral part of Canadian policy, so there is little likelihood of Canada following the U.S. path," Geist said in an email. He also said that internet and related issues could become part of the North American Free Trade Agreement, currently being renegotiated by Canada, Mexico and the United States. He said that net neutrality "is a must" if the NAFTA digital trade chapter is to mean anything — because Canadian internet traffic often travels from, to or through the United States. "Indeed, given the potential impact on Canadian businesses, Canada should be promoting the inclusion of a strong and effective net neutrality provision in NAFTA," Geist said.